It is our mission at Tudor Elementary School in Anchorage, Alaska to connect with students, leaders, and global citizens around the world to discuss peace, which is the United Nations Sustainable Development Goal number 16. We aim to be a part of the solution, will you join us? We are often told that something big must begin with something small combined with a lot of passion to make it grow. That is our mission. We have a passion to advocate peace, in a time with so much chaos. We want to reach out to the world and discuss peace! Our project began in late 2016 with students simply visually and orally showcasing and recording what peace means to us, in our lives, in our communities, and in our world. 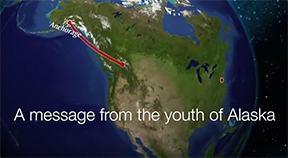 By May 2017, we connected with hundreds of schools, leaders, activists, and educators around the world through our peace video. This year, talked directly, through Skype, about what peace is and what it means as global citizens. We want the discussion of peace to grow even bigger! We want to share what peace looks like here in Alaska, for our global fiends, and because we are so far from the rest of the world, we want to know what peace looks, sounds, feels like in the rest of the states and the world. Spreading peace and the discussion of peace helps cultivate us into becoming global citizens. Please join us on this mission to learn and become global citizens. It's really easy to get involved. We embark on our live Skype connections during the week containing International Day of Peace, September 21st, of each year. We share, creating displays, and connect with the world. Feel free to join us for Peace Week 2018 in the fall. But ... you don't have to wait to share peace! Submit your pictures, videos, writings, posters, or messages to carton_michelle@asdk12.org and we will include it on our peace showcase! See how it all got started and what we created last year! 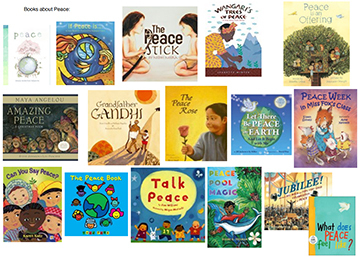 Find some book titles to help your class introduce the conversation of peace (of course you don't have to use these ones). Let is know about the books you are reading. Get the templates to share your peace showcase. Let's connect through email about setting up date/time to meet! You can also create whatever you want, such as a video, a poster, anything! Share pictures and videos onto the Padlet of your Peace Adventures. Such a simple project can create so much joy and hope in the world and in our students! Let us know what you're reading or any questions we can help with!